Former FBI director Louis Freeh calls Holder a man of "tremendous integrity"
WASHINGTON (CNN) -- Former FBI Director Louis Freeh said Friday that Attorney General-designate Eric Holder allowed himself "to be used" by the Clinton White House in the pardon process for then-fugitive financier Marc Rich in January 2001. Former FBI director Louis Freeh calls Attorney General-designate Eric Holder man of "tremendous integrity." But Freeh told senators at Holder's confirmation that Holder was nevertheless a man of "tremendous integrity" who "will never allow himself again to be put in that position." "The pardon of Marc Rich was a corrupt act," Freeh said, but was not Holder's responsibility. Freeh asserted that President Bill Clinton's White House staff kept the FBI and Justice Department "in the dark" and "actively conspired" to ensure that nobody knew what pardons were being considered shortly before Clinton left office. "The [Clinton] White House went to extraordinary lengths to deceive the attorney general, myself, the Department of Justice and everyone about who was on the secret pardon list. ... I don't think it's fair to put that blame totally on Eric Holder," Freeh said. "He takes responsibility, and he will never make that mistake again." Holder, Freeh said, had a proven track record of "political independence" and an ability "to say no" to the White House when necessary. 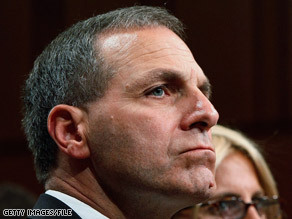 Freeh was the opening witness on the second day of Holder's confirmation hearing. He was particularly quick to admit that he made mistakes during the Rich pardon incident at the end of the Clinton administration that were "not typical" of his conduct over most of his career. Holder said he "made assumptions that turned out not to be true" during Rich's pardon process, which turned out to be the "most intense" and "searing" experience he "ever had as a lawyer." He said that as a result of the experience, he would "be a better attorney general." One of the lessons of the Rich case, Holder stated, is the need for "full consultation with all lawyers in the pardon process." He said there is a need to improve the pardon process, which seems to experience a "deterioration ... at the end of every administration." Holder was also harshly criticized Friday for "playing Russian roulette" with the safety of Americans for making an "egregious recommendation" in 1999 of clemency for 16 members of a Puerto Rican nationalist group convicted of conspiracy and bomb-making charges. Joseph Connor, the son of a victim of a 1975 New York City restaurant bombing by the FALN -- or Armed Forces of National Liberation -- testified that the former federal judge and prosecutor was "soft on terror" and, as a result, should be "disqualified" for the position of attorney general. "These terrorists took away my dad's life," Connor said. "Did he actually believe in their cause? Did he not know what they did?" Holder stated during his confirmation hearing Thursday that Clinton's decision to grant clemency to the 16 FALN members "was reasonable." Holder also noted that there were "a lot of people in support of that clemency request," including former President Jimmy Carter and Coretta Scott King, the widow of the Rev. Martin Luther King Jr. The FALN is responsible for multiple attacks on U.S. military installations. Holder, who will be the nation's first African-American attorney general if confirmed, pledged to support interrogation techniques that are "effective," but don't "serve as recruiting tools for the enemy" or violate America's treaty obligations. Any techniques used by the government, Holder said, need to be "consistent with who we are as Americans." Justice Department officials have admitted that waterboarding -- one of the greatest points of dispute between the Bush administration and both congressional Democrats and civil liberties watchdog groups -- was used in the past, but is no longer practiced, officials have said. The debate over waterboarding was one of a series of issues covered in Holder's confirmation hearing that have sharply and often bitterly divided Democrats and Republicans over the past eight years.